Upper Respiratory Infection Versus Lower: What’s the Difference? The body’s respiratory system includes the nose, sinuses, mouth, throat (pharynx), voice box (larynx), windpipe (trachea), and lungs. Upper respiratory infections affect the parts of the respiratory tract that are higher on the body, including the nose, sinuses, and throat, while lower respiratory infections affect the airways and lungs. Types of upper respiratory infection include the common cold (head cold), the flu, tonsillitis, laryngitis, and sinus infection. Of the upper respiratory infection symptoms, the most common is a cough. Other symptoms of upper respiratory infection may include stuffy or runny nose, sore throat, sneezing, muscle aches, and headache. Lower respiratory infection can be caused by bronchitis, pneumonia, respiratory syncytial virus (RSV), severe flu, or tuberculosis, for example). Lower respiratory infection symptoms include a severe cough that may produce mucus (phlegm), cause shortness of breath, chest tightness, and wheezing when exhaling. Whooping cough (pertussis) caused by the Bordetella pertussis bacterium. Whooping cough is a highly contagious respiratory infection characterized by uncontrollable, violent coughing that can make it difficult to breathe. The whooping cough sound comes from an ill person taking a deep breath after a coughing fit, making a "whooping" sound in the process of sucking air in. Early whooping cough symptoms resemble a common cold, and include sneezing, runny nose, stuffy nose, fever, other cold symptoms, and a mild cough. 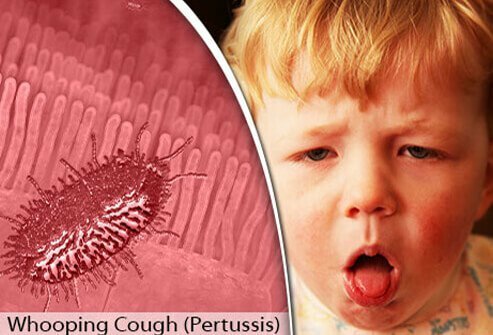 After 1-2 weeks the cold symptoms of whooping cough get better but the cough gets worse and can last for weeks. Anyone, including adults, can get pertussis, but whooping cough in infants can be particularly severe and even life threatening. Once considered a disease of yesteryear, whooping cough returned to national headlines in 2010 when 10 infants in California died during a whooping cough outbreak. Whooping cough is highly contagious. Pertussis bacteria are usually spread by coughing, sneezing, or sharing a breathing space. People infected with whooping cough are most contagious up to two weeks after the cough begins. The pertussis vaccine is recommended for both adults and children. This vaccine helps prevent the spread of infection of whooping cough in infants and others. Whooping cough vaccines are available beginning at 2 months old, with subsequent doses (booster shots) required throughout early adolescence. Swine flu (H1N1) is a respiratory illness caused by an Influenza-A virus. A virus’s genetics allow that particular virus to live inside a specific species, like a human, cat, dog, monkey, and others. The swine flu gets its name because the Influenza-A viruses that causes swine flu (H1N1v viruses) show genetic similarities to viruses that infect pigs. As with any seasonal flu, swine flu symptoms can include fever, cough, sore throat, a general feeling of being unwell (malaise), headache, chills, muscle pain, and joint pain. Swine flu symptoms can also include vomiting and diarrhea. Can You Catch Swine Flu from Eating Pork? How is Swine Flu Spread? Swine flu cannot be spread by eating cooked pork products. It is possible for swine flu to spread from pigs to humans, though this type of spread is most common among people in places like pig barns and livestock fair exhibits housing numerous live pigs. Usually, swine flu is spread from person to person though sneezing, coughing, or kissing. H1N1 flu is typically contagious from 1 to 7 days of the initial viral infection. The swine flu vaccine is prepared either as a shot or as a nasal spray. As a shot, the swine flu vaccine is a “killed virus” vaccine. As a nasal spray, the H1N1 virus vaccine is a “live virus” vaccine that has been weakened (attenuated). In each case, the swine flu vaccine works by exposing patients to a small dose of the virus, which helps the body develop its own immunity to swine flu. People as young as six months old can begin to receive swine flu vaccination. Avian (bird) flu is an illness also caused by an influenza- A virus. 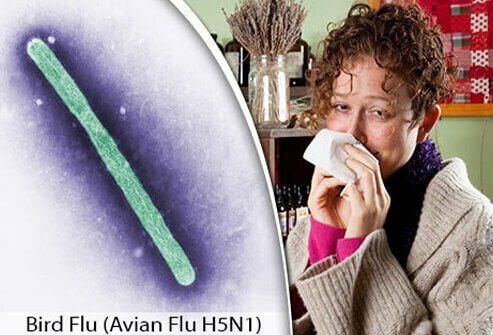 Most human illnesses from avian flu have been caused by the LPAI (low pathogenic avian flu) H7N9 and HPAI (high pathogenic avian flu) H5N1 variants that have genetic similarities to viruses found to infect birds. People infected with bird flu have often been in close contact with sick birds and their droppings, or in direct contact with someone else already infected with the bird flu virus. Bird flu symptoms include fever, cough, difficulty breathing, diarrhea, headache, body aches, confusion, sore throat, and runny nose. Bird flu can be life threatening. About 40% of those infected with H7N9 and 50% of people infected with the H5N1 variant die from complications. Antiviral medications are usually prescribed and can help cope with bird flu symptoms; severe infections usually require hospitalization in an intensive care unit with supportive treatments like mechanical breathing support and oxygen administration. The best way to prevent bird flu it is to avoid sources of exposure like contaminated poultry farms, aviaries, or coops. In case of a bird flu outbreak, an H5N1 vaccine is available from the US government; it is not typically suggested as a season flu vaccine. Non-polio enterovirus refers to a group of very common viruses that cause 10 to 15 million infections annually. 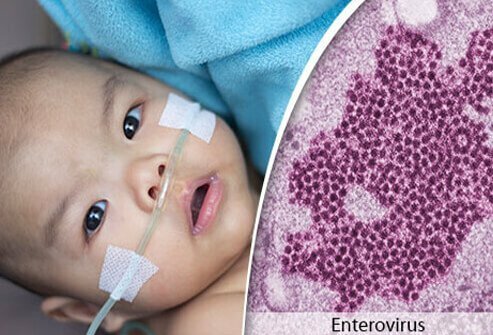 There are many non-polio enteroviruses such as enterovirus 71, which has caused large outbreaks of hand, foot, and mouth disease worldwide, but typically most people infected by enterovirus experience nothing more than the common cold. Anyone can get the enterovirus, which is transmitted through person-to-person contact. Those most likely to exhibit enterovirus symptoms are infants, children, and teens. Enterovirus symptoms resemble those of the common cold, and include fever, runny nose, sneezing, cough, skin rash, mouth blisters, and body and muscle aches. Of the many types of enterovirus, about half are known to cause an enterovirus rash. People affected by enterovirus symptoms may also have trouble breathing and experience wheezing. Many infected patients can be treated by their primary care physician. If complications arise, infectious-disease specialists, critical-care specialists, cardiologists and/or lung specialists may be called on for treatment. There are currently no antiviral medications available for non-polio enteroviruses. Seasonal influenza (“the flu”), is an acute respiratory illness caused by influenza A or B viruses and is most dangerous to children, seniors, and those with weakened immune systems. The flu is contagious, spreading through droplets created when an infected person coughs, sneezes, or talks. Children may be able to pass the flu virus for longer than seven days, and some people who are infectious may show no symptoms of flu. Flu symptoms begin one to four days after the virus enters the body. Flu symptoms include fever, chills, cough, sore throat, runny or stuffy nose, muscle or body aches, headaches, and fatigue. Flu symptoms in children may also include vomiting and diarrhea. Although flu symptoms may include vomiting and diarrhea, especially in children, this does not necessarily mean a child has “stomach flu.” Stomach flu is caused by intestinal infection from a virus, typically rotavirus or norovirus. In other words, stomach flu is actually a different disease all together from influenza. 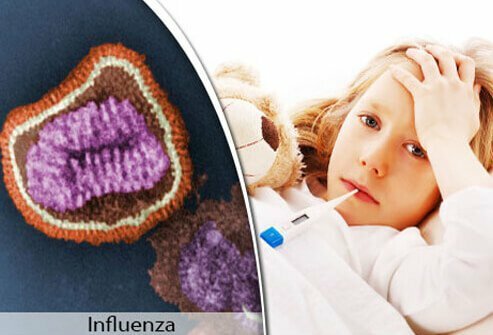 How Long Does the Flu Last in Children? Some flu symptoms in children typically last longer than others. Fever and muscle aches usually go away after two to four days, but cough and fatigue flu symptoms can continue for one to two weeks or longer. The Centers for Disease Control (CDC) estimates about 20,000 children under the age of 5 are hospitalized due to flu complications every year. Severe complications from flu symptoms are most common in children under 2 years old. Everyone 6 months of age and older should get a flu shot annually to help prevent the spread of the seasonal influenza virus and flu infections. Flu vaccines contain inactive (dead) viruses triggering an immune response without infection. This helps the body produce flu antibodies thus preventing further infection. A nasal spray vaccine has been approved for use in people ages 2-49. The CDC recommends everyone get a flu shot as soon as they become available, or at least by October as the flu shot takes up to 2 weeks to become effective. Beyond vaccination, experts recommend keeping children home if they are sick with the flu. Washing hands often with soap and water when available, and when not, using an alcohol-based hand rub. Avoid sharing food utensils, dishes, bedding and clothes with children who are sick with the flu. Clean and disinfect frequently touched surfaces such as toys and play areas to prevent the spread of flu viruses. Seasonal influenza (“the flu”) in adults is also caused by the Influenza A or B viruses. The flu can be unpredictable and flu symptoms can range from mild to severe. Flu symptoms in adults are often the same as in children: fever, chills, cough, sore throat, runny or stuffy nose, muscle or body aches, headaches, and fatigue. Vomiting and diarrhea may also count among flu symptoms in adults, though this is more common in children. Complications of the flu can include bacterial pneumonia, ear infection, sinus infection, dehydration, and worsening of chronic medical conditions, such as congestive heart failure, asthma, or diabetes. The Centers for Disease Control (CDC) estimates 200,000 people are hospitalized each year due to flu complications and deaths from the flu range from 3,000 annually to 49,000, depending on the severity of the flu virus in a particular season. Seniors and those with compromised immune systems are the most at risk for flu complications. Treating flu depends on what flu symptoms are present. Decongestants work for nasal or sinus congestion flu symptoms. Antihistamines may be helpful for runny nose, postnasal drip, or itchy, watery eyes. An occasional cough can help clear the lungs, while a persistent cough can be treated with various cough medicines, often containing combinations of decongestants, antihistamines, analgesics/antipyretics, expectorants, and cough suppressants. Ask a pharmacist for help choosing which combination is best for relieving your symptoms. Over-the-counter medicines available to treat fever and body aches include ibuprofen (Advil, Motrin) and naproxen (Aleve). 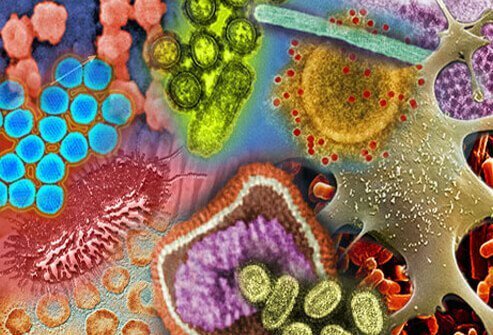 Each year, different flu viruses spread at different times each year. In the United States, flu season begins as early as October and ends as late as May. Flu infections usually peak in January or later. Getting a seasonal flu vaccine is the best way to prevent the flu. All adults should get a flu shot every flu season. It takes two weeks from the time of vaccination for antibodies to develop in the body to protect against the flu. Some people are not suitable for flu shots. A person’s age, health history and allergies (including egg allergy) should be considered before receiving a flu shot. Walking pneumonia symptoms are similar to the common cold and may include sore throat, fatigue, fever, headache, and a worsening cough that lasts from weeks to months. Other walking pneumonia symptoms may include loss of appetite, wheezing, and shortness of breath. Bacterial pneumonia (for example, Streptococcus spp.) produce more serious symptoms than walking pneumonia; many patients need hospitalization. In contrast to walking pneumonia, patients experience more severe fatigue, fever, a productive cough and are not able to be “walking “around. Some may require intensive care and respiratory support. Antibiotics are highly effective in treating bacterial pneumonia and walking pneumonia if the bacteria are not resistant to the antibiotics. Most people see improvement in two to three days after beginning antibiotic treatment but some bacterial pneumonias take longer even with IV antibiotics. 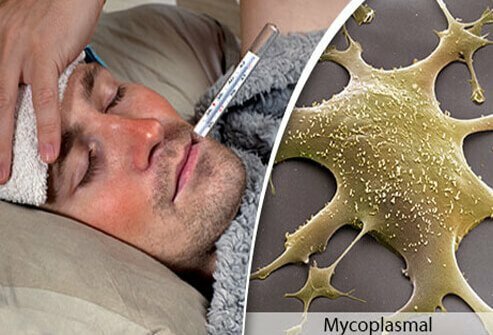 One third of all people who contract the Mycoplasma pneumoniae (M. pneumoniae) bacterium develop a bacterial pneumonia often referred to as “Walking pneumonia,” so-called because the symptoms are typically mild. M. pneumoniae can also develop into tracheobronchitis, causing inflammation and chest congestion. Walking pneumonia occurs most often in crowded settings such as schools, military barracks, nursing homes, and hospitals. Bacterial pneumonias, except for tuberculosis, are not very contagious. They can occur from bacteria normally in the nose or throat when conditions allow their spread to the lungs. Walking pneumonia symptoms are similar to the common cold and may include sore throat, fatigue, fever, headache, and a worsening cough that lasts from weeks to months. Other walking pneumonia symptoms may include loss of appetite, wheezing, and shortness of breath. To treat the symptoms of walking pneumonia, drink plenty of water, rest, avoid smoking, and take aspirin or acetaminophen for body aches. 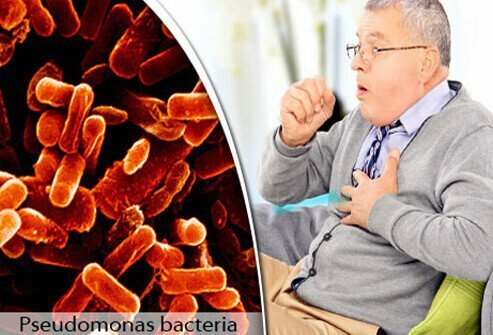 Bacterial pneumonia symptoms are more severe; including a severe cough with thick yellowish or blood-tinged sputum, chest pain with coughing or breathing, high fever, headache, chills and possible breathing difficulty. M. pneumoniae and other bacteria are spread by coughing and sneezing. To avoid spreading the disease, cover your mouth when you cough or sneeze, put used tissues in the trash, wash hands with soap and water for at least 20 seconds or use an alcohol rub if no water is available. If you don’t have a tissue, cough into your elbow or sleeve rather than your hands. Viral pneumonia is a lung infection that can occur in anyone of any age, but is more common in young children and the elderly. Common causes of viral pneumonia include Influenza A or B ("flu"), respiratory syncytial virus (RSV), parainfluenza, and adenovirus. Worldwide, viral pneumonia is the leading cause of death among children younger than 5 years old. Because it is caused by infectious microbes, viral pneumonia is contagious. This is true with many forms of pneumonia. However, viral pneumonia is considered less contagious than the flu. Risk factors for developing pneumonia include smoking or underlying medical conditions such as heart disease or diabetes. Viral pneumonia symptoms include cough with phlegm, fever, chills, shortness of breath, fatigue, muscle aches, headache, sweating, clammy skin, and confusion (especially in the elderly). Unlike bacterial pneumonia, antibiotics won’t help if you have viral pneumonia. A doctor may prescribe antiviral medications. Because different viruses may cause pneumonia, your doctor will choose different treatment drugs depending on the infecting microbe. If influenza has caused your viral pneumonia symptoms, a doctor may prescribe medications to help stop the spread of flu in your body such as oseltamivir (Tamiflu), zanamivir (Relenza), or peramivir (Rapivab). If RSV is to blame for your viral pneumonia symptoms, your doctor may try to limit the spread of the virus with medication such as ribavirin (Virazol). Viral pneumonia can often be prevented with vaccines for the instigating viruses (the flu shot, for example). In addition, cleanliness can help prevent the spread of pneumonia-causing viruses: wash hands often with soap and water for at least 20 seconds (especially before eating or preparing food), stay away from people who are coughing or sneezing and keep your hands away from your eyes, ears, nose and mouth. Bronchitis is a condition whereby the bronchi (the air passages within the lungs) become inflamed. Smoking is the most common cause of chronic bronchitis, but dust, allergens, and toxic gases can also trigger bronchitis. In addition to inhaled pathogens, viruses or bacteria are the most common causes of acute bronchitis. Bronchitis symptoms include persistent cough, coughing up phlegm (mucus), shortness of breath, chest congestion, chills, body aches, and wheezing. Fever is an uncommon bronchitis symptom, and when it occurs it is usually low-grade. In acute bronchitis, symptoms last for more than five days, and up to three weeks. If bronchitis symptoms last for at least three months of the year during two consecutive years, the illness is considered chronic bronchitis. Since bronchitis symptoms can be brought on by either viruses, bacteria or allergens, answering the question “Is bronchitis contagious?” depends on the cause of the bronchitis. Most people with acute bronchitis are contagious if they were infected by a virus or bacterium. As infectious bronchitis symptoms wane, people with bronchitis are less likely to be contagious. Acute bronchitis treatment consists of drinking plenty of fluids, resting, and avoiding smoking and fumes. Chronic bronchitis treatment may include an annual flu vaccine, pneumococcal vaccine, bronchodilators or inhalable steroids. Because many cases of acute bronchitis result from influenza, a yearly flu shot can help protect against bronchitis as well. To avoid the spread of the underlying causes of bronchitis, prevention includes avoiding cigarette smoke, washing your hands, and wearing a surgical mask at school, at work and in crowds if you think you may be infected. Adenoviruses are the most common cause of the common cold (also called a “head cold”). People infected with the common cold become contagious a few days before symptoms appear and remain contagious until all symptoms have gone. In total, those infected with the common cold remain contagious for about two weeks. The common cold spreads by touching surfaces contaminated by infected droplets, including other people’s skin, and then touching your mouth, nose or eyes. The cold virus can also spread by inhaling tiny droplets of fluid containing the cold virus that are released when an infected person coughs or sneezes. Common cold symptoms may include sore throat, bronchitis, runny or stuffy nose, diarrhea, pink eye (conjunctivitis), and fever. Adenovirus infection can lead to pneumonia. When it comes to the common cold, most symptoms last about a week. However, cold symptoms can last up to two weeks. Using pain relievers such as acetaminophen to treat fever, sore throat and headache. Children and teenagers should never take aspirin due to the risk of Reye’s syndrome. Decongestant nasal sprays can be used by adults for up to five days—prolonged use can cause symptoms to rebound. Children younger than six should not use decongestant drops or sprays. Cough syrups may be helpful in relieving some cold symptoms. Children younger than age 4 should never be given over-the-counter cough and cold remedies according to the Food and Drug Administration. Most importantly, drink lots of fluids. This keeps cold sufferers hydrated and helps prevent another infection from setting in. Adequate rest is also helpful in fighting off infection. Because the common cold is the result from an infection, nearly 250 different viruses can lead to a cold. Scientists have not yet been able to develop a cold vaccine to protect against all possible cold infections. Controlling the spread of the viruses responsible for colds is the most effective form of cold prevention. To help prevent the common cold, wash your hands with soap and water or an alcohol-based rub, disinfect kitchen and bathroom countertops and children’s toys, use tissues when sneezing or coughing and throw them in the trash, avoid sharing food, cups, plates and eating utensils, avoid close contact with cold sufferers, and choose child care providers with good hygiene routines and stay-home policies for sick children. Eating well, exercise, getting plenty of sleep, and managing stress can help prevent the common cold. Severe acute respiratory syndrome (SARS) is a severe viral respiratory infection caused by coronavirus SARS-CoV. 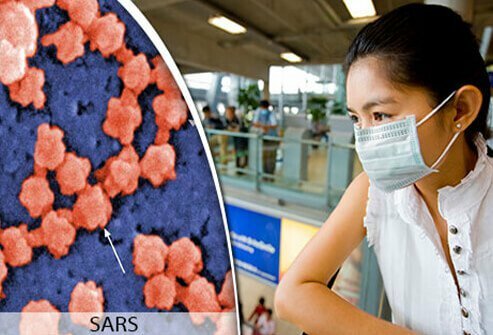 The SARS virus outbreak began in China in 2003 and spread worldwide, infecting over 8,000 people before it was contained. SARS virus spreads mainly through person-to-person contact. Since 2004, there have been no known SARS virus cases reported. SARS symptoms include fever, cough, chills, muscle pain, shortness of breath, headache, and diarrhea. Most SARS patients go on to develop pneumonia. SARS victims usually require oxygen and possibly mechanical ventilation. Currently there are no medications that aid in SARS treatment. Local, state agencies, the CDC and WHO should be notified immediately if a SARS infection is diagnosed. Chinese and U.S. scientists have been working to create a SARS vaccine, but research has been made difficult by an absence of active disease to test treatments against. Research has been based around monoclonal antibodies, which hold promise as future diagnostic tools for SARS infection and treatment. Recommended SARS prevention measures include washing hands with soap and hot water or an alcohol-based hand rub, wearing disposable gloves if contacting an infected person’s body fluids or feces and throwing those gloves away immediately, wearing a surgical mask, washing personal utensils, towels, bedding and clothes with soap and hot water, and disinfecting any household surfaces that may have come into contact with an infected person’s sweat, saliva, mucus, vomit, stool or urine. Middle East respiratory syndrome is caused by coronavirus MERS-CoV. Middle East respiratory syndrome was first reported in Saudi Arabia in 2012, and the original source of the virus is unknown but is suspected to have come from camels. Only two patients have ever tested positive for MERS in the United States. Both worked in health care and had recently been to Saudi Arabia. Symptoms of Middle East respiratory syndrome include fever above 100.4°F (38°C) with chills or shivering, sore throat, cough (sometimes coughing up blood), difficulty breathing, vomiting, abdominal pain, diarrhea, and muscle aches. There is no specific antiviral treatment recommended for MERS-CoV infection. Other forms of medical care may be available to help treat symptoms related to MERS. As with SARS, MERS patients usually require oxygen supplementation and possible mechanical ventilation. Local, state agencies, the CDC and WHO should be notified immediately if a MERS-CoV infection is diagnosed. There is currently no vaccine or cure for MERS. The same preventative measures for other respiratory illnesses apply to MERS infection: wash hands or use an alcohol-based sanitizer, cover your nose and mouth when coughing or sneezing and throw the tissue away immediately, avoid touching eyes, nose and mouth with unwashed hands, avoid kissing, sharing food or drinks with sick people, and clean and disinfect contaminated surfaces such as doorknobs and bathroom countertops. American Lung Association: "Pneumonia Symptoms, Causes, and Risk Factors"
CDC: "Pertussis (Whooping Cough)", "Avian Influenza A Virus Infections in Humans", "Non-Polio Enterovirus", "Children, the Flu, and the Flu Vaccine", "Key Facts about Influenza (Flu) & Flu Vaccine", "Mycoplasma pneumoniae Infection", "Pneumonia", "SARS", "MERS in the U.S.", "2009 H1N1 Flu ("Swine Flu") and You"
Medical Microbiology, 4th edition: "Infections of the Respiratory System"
National Health Services (UK): "Respiratory Tract Infections"
UptoDate.com: "Patient Information: Whooping Cough (The Basics)", "Epidemiology, Transmission, and Pathogenesis of Avian Influenza", "Patient Information: Enterovirus D68 (The Basics)", "Seasonal Influenza in Children: Clinical Features and Diagnosis", "Treatment of Seasonal Influenza in Adults", "Mycoplasma Pneumoniae Infection in Adults", "Patient Information: Acute Bronchitis in Adults (Beyond the Basics)", "Epidemiology and Clinical Manifestations of Adenovirus Infection", "Severe Acute Respiratory Syndrome (SARS)", "Patient Information: Middle East Respiratory Syndrome Coronavirus (The Basics)"